This section describes the steps to setup and run multiple instances of CNCnetPDM on a single PC. 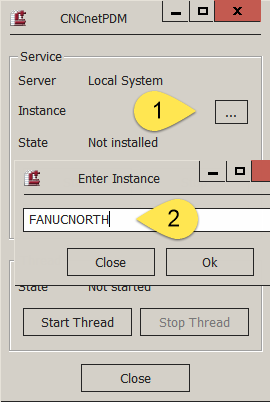 You can configure all parameters of the instance by editing the respective configuration file of the instance, in this example CNCnetPDMFANUCNORTH.ini. After editing the file and stopping and starting the program or service again the altered parameters are used by the instance. Note: Please do NOT run CNCnetPDM as a foreground program and/or instance and non-instantiated service with the same .ini file content at the same as this leads to unpredictable results. Information about the instance can also be found in file log_master_YYMMDD.txt in the log directory of CNCnetPDM.